When shopping for glasses, the amount of different types of frame materials may overwhelm you. Acetate, plastic, TR-90, aluminum, titanium, and the list goes on. What exactly is the difference between all these? And what best suits your life style? Let us briefly summarize each material and help you make a more informed decision. Plastic is a frame material that is used in very inexpensive glasses, such as kid’s sunglasses. Plastic by itself is an inferior material that easily bends and breaks. Often, the frames are so easily bent that the lenses fall out. Plastic frames are okay for occasionally worn “statement pieces,” but we highly recommend a more durable material for glasses that will be worn every day. Acetate has become a very popular material, thanks to the trendy "nerd style" glasses. Cellulose Acetate Propionate and Zylonite (both commonly known as acetate) are hypoallergenic materials, which have more gloss and transparency than its fellow plastic materials. Acetate is a nylon-based plastic, which means it’s very strong in addition to being lightweight. Acetate comes in many different colors, with a high, rich luster, and is produced in high quality, sandwiched sheets. The frame is stamped from these sheets and requires hand crafting to attain its final shape and appearance. TR-90 is an impact resistant material, thus making it very suitable for children. TR-90is a type of nylon material, and can be found in either a soft, rubber-like texture, or a hard, plastic type texture. Both types are very tough, yet flexible. The material is a memory material, which means it can be bent and will return to its original shape upon release. TR-90’s low density and high resistance to chemicals and stress cracking make it an excellent choice for wearer comfort and sports frames. Keep in mind when choosing an acetate, plastic or TR-90 frame that it is a little less durable than metal. These materials can fade, burn, and lose strength over time. However, taking proper care of your glasses can greatly reduce these problems. Titanium is a premium material and is available in many different colors and styles. Titanium or beta titanium is a very strong dark silver material that is durable, corrosion resistant, lightweight and hypoallergenic. Titanium can be dyed different colors. Titanium is an ideal material for rimless frames; combined with high index glasses it will make for an almost weightless pair of glasses. It is a premium material that is suitable for everyday use. Aluminum is a lightweight and durable material. Aluminum frames have a very unique look. Aluminum is corrosion-resistant and lightweight. It is necessary to add silicon and iron to create a hard and strong material, because naturally aluminum is soft and weak. Stainless steel can be an economic alternative to titanium, because it is an alloy of steel and chromium, which is a material that keeps the steel from corroding. Mixing steel with chromium also offers protection against heat and abrasion. Stainless steel is a lightweight and strong material. It is usually nickel free, thus making it hypoallergenic. Memory titanium alloy is very flexible and corrosion-resistant. Memory titanium alloy is a titanium-based material. This material can be bent in almost any direction and still spring back to its original position. It also protects the frame from bending and crushing. It is a corrosion-resistant and lightweight material. Monel is a common frame material, which is a blend of a wide range of metals. Be careful with monel if you have a nickel allergy*, as this material may contain nickel. It’s not completely corrosion resistant, but a simple way to make monel both a hypoallergenic and a corrosion-resistant material is by plating it with a nickel-free option such as palladium. Sterling silver is certainly an option for frames, but is not very comfortable. It’s not lightweight. Silver, however, does make a great material for accents on other frames. Bamboo temples give you and your glasses a very unique look. Bamboo and wood will make your glasses a statement piece. Please keep in mind that these materials cannot be adjusted at all. These materials are wonderful if you are looking for a pair of extremely unique glasses. Another way to spice up your frames is through the addition of rhinestones and other precious stones. No matter which frame material you ultimately decide on, make sure you feel comfortable with the properties and the style. These frames are to compliment you and your style, so make sure you are getting exactly what you want. 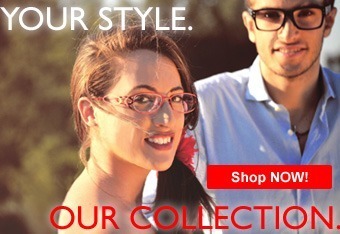 Here at Visio-Rx we strive to carry the largest online selection of frames, so that success is guaranteed for you! *Remember, it is better to be proactive than reactive. If you have nickel allergy and are unsure of the materials used in a specific frame, it is better to opt for a different material that is definitely hypoallergenic rather than take the chance of inducing an allergic reaction.